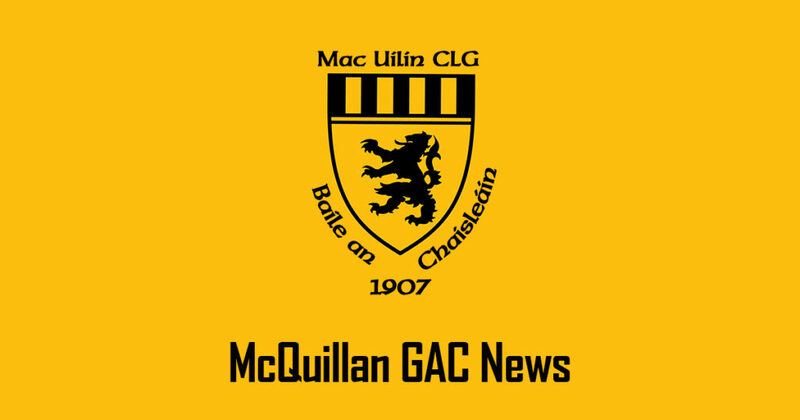 The 110th MacUílín CLG Baile an Chaisleáin Annual General Meeting was held on Sunday 3 December at 4pm at Páirc MacUílín. The Chairperson welcomed everyone to the meeting and after a minutes silence for deceased members the meeting commenced. The Secretary and Treasurer provided reports and the Chairperson addressed the members prior to the elections. In line with SGM on 1st August 2017 and development nights feedback MacUilin CLG merge with Ballycastle Camogie Club on 1st January 2018 to form one Club. Membership rates are adjusted to better reflect the ongoing costs and be set by the Executive Committee for 2018. £30 for all new members (new member or if previous member then membership must have lapsed for two years) for the first year and £50 from second year. All rights as full member. The Executive Committee shall be comprised of the Chairman, Vice-Chairman, Treasurer, Assistant Treasurer, Secretary, Assistant Secretary, Registrar, one Players’ Representative, one camogie player’s rep, and at least five other Full Members. 11.02 In accordance with Comhairle Uladh CLG Code of Best Practice everyone involved in the management, coaching, office bearer or otherwise, working with Children or Young Adults (U-18) must be vetted within one month of appointment through Access NI and successfully complete the GAA Child Protection and Foundation Coaching course. Failure to comply with this will result in being removed from post. That the members approve the plan presented on Sunday 26th November 2017 and fit out a training hub with the short term lease of 54 Castle Street, Ballycastle for a period of 5 years (get out clause after 3 years). The Development Officer and sub-committee/s will then explore a long term option to provide a larger indoor facility onsite at PaircMacUilin by 2022 for approval by the members. That the Executive Committee be allowed to replace the 3G goal mouth if required during 2018. The 10 year life span of the existing is up. The original cost was £12000 + vat.